Often considered one of the greatest comedies of all time, this film is certainly hilarious and special. This was one of Marilyn Monroe’s best performances, and her costars were absolutely brilliant. As far as humor goes it cannot get much zanier and crazier than this. In this Billy Wilder directed comedy, Tony Curtis, Jack Lemmon, and of course, Marilyn Monroe teamed up in making a great movie. In the era of Chicago gangsters, two male musicians witness a shooting that they wish they had not. In order to escape, they join a traveling band. The only catch is that it’s an all-women group, and so they get dressed up to win the job. The rest of the film follows their crazy cross-dressing antics with the band as they spend their time at a beach resort in Florida. It includes two tremendous love stories on completely different ends of the spectrum! One involving a wealthy young yacht owner and Sugar. The other involving Daphne and well…The movie was filmed in black and white to camouflage all the makeup but as you will find out no movie’s perfect! However, the script from Billy Wilder as well as Lemmon’s performance are the real attraction to keep an eye out for. Watching this film certainly gave me tremendous respect for the writing. The double talk between Josephine and Daphne is great. There is tremendous comedic irony, and some of the sequences are downright hilarious. First and foremost, I think Jack Lemmon is a wonderfully funny man, but he plays so well off of Tony Curtis, Marilyn Monroe, and Joe E. Brown. The basic concept of male musicians masquerading as women was a good idea, but I think these actors with Wilder’s directing really made it work well. 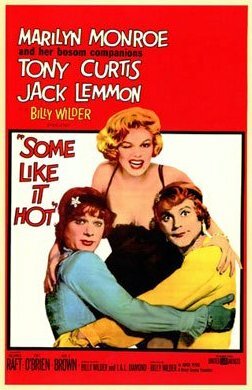 The juxtaposition of the two love stories is important too because you could call Some Like it Hot a romance or even a crime-drama initially, but above all, it is unabashedly a comedy. All you need to see is Jack Lemmon with maracas or hear the last line of the film and that remains completely evident. It was fun to finally see the Hotel Del Coronado, as I thought to myself that this is where some of the film was shot. Tony Curtis even spoke those four eponymous words on the same beach over 50 years ago now. It may be over 50 years later, but in my mind this film is timeless. I could not help but think of Jack Lemmon’s line as I reclined on the beach, “I’m a boy. I’m a boy. I wish I were dead. I’m a boy. Boy, oh boy, am I a boy.” Hopefully, I never run into the same problems they did. This entry was posted in 1950s, Comedy, Crime, Romance and tagged AFI, Billy Wilder, George Raft, Great Film, Jack Lemmon, Joe E. Brown, Marilyn Monroe, Mike Mazursky, Review, See Before You Die, Tony Curtis by 4StarFilmFan. Bookmark the permalink.